You typically use the IsToggled property in a keypress handler to check the state of a toggle key like Caps Lock. 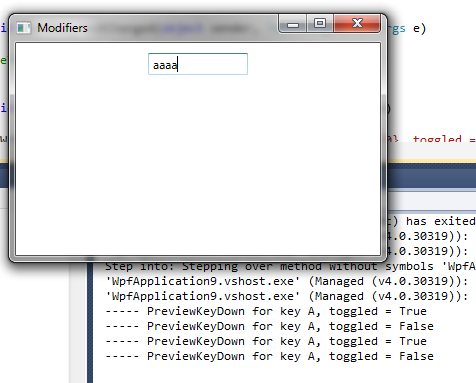 But WPF actually keeps track of a “toggled” state for every key that you press. For example, if you press the letter ‘a’ a number of times in a TextBox and look at the value of the IsToggled property, you’ll see that the property switches between true/false values. WPF is keeping track of the “toggled” state for the ‘a’ key, even though it’s not normally used as a toggle key.